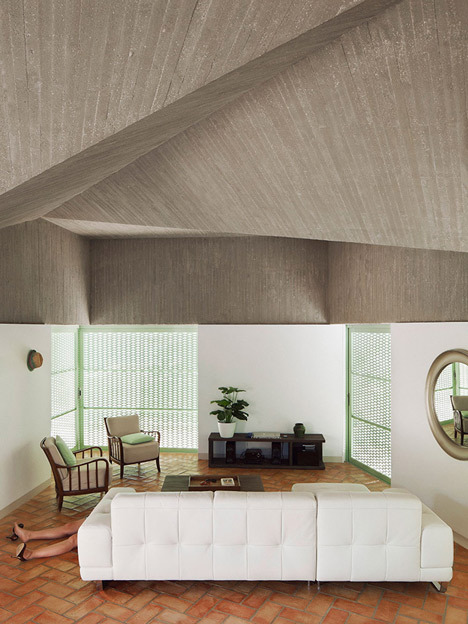 A raw concrete house in Alicante by Spanish studio Langarita-Navarro Arquitectos becomes the scene for a string of mysterious murders in this series of images that take on a macabre playfulness to the usual, ‘straight-faced’ architectural shots most architectural firms commission. 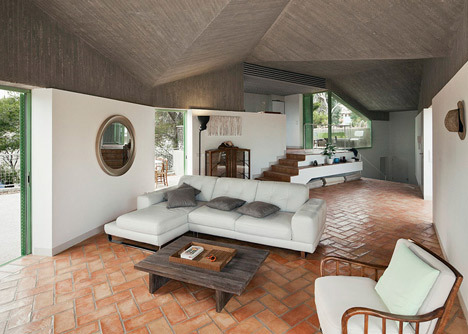 Rather than an attractive tourist destination, photographer Luis Diaz Diaz chose to photograph the holiday house in the Spanish town of Benissa as if it were a crime scene. “Every time I take pictures of houses I think about all of the things that could happen inside,” Diaz Diaz said in an interview with Dezeen the online magazine. “Many things happen in the life of a house, sometimes good sometimes bad; it can be robbed, or there could be a big party. So a house is the perfect place for creating a fantasy. One image features a man slumped over the mint-green frame of one of the house’s many large windows, while another features a woman lying behind a sofa on the terracotta tiles of the living room floor. “I wanted to create a contrast between the clarity of the architectural lines of the house and these kind of weird events,” explained the photographer. 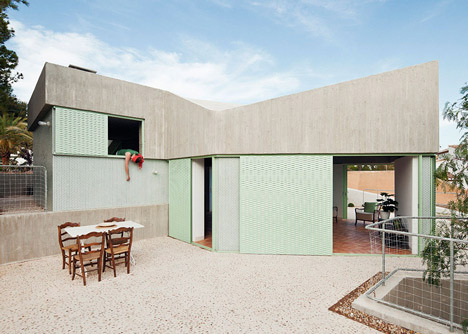 Tags: Alicante, Benissa, Casa Baladrar, concrete house, Langarita-Navarro Arquitectos, Luis Diaz Diaz, murder scene, Spain. Bookmark the permalink.